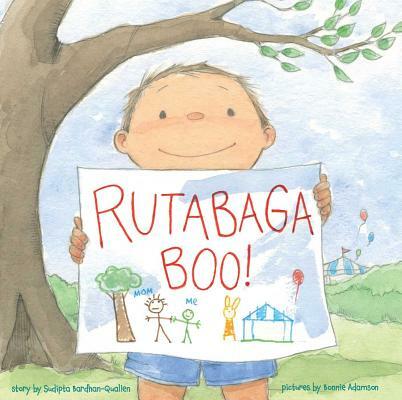 Two simple words -- rutabaga and boo -- tell a clever, playful, and heartfelt story celebrating the special bond between a mother and her son. Mom isn't always nearby…but she's never too far away. Through their “Marco Polo”-inspired back-and-forth of “Rutabaga?” and “Boo!,” a mother and son spend a day full of fun. Whether they're bouncing out of bed, playing in the park, or keeping in touch while Mom is on a trip, one constant is the comforting reassurance that even when they're physically apart, they're always connected by the love they share.